When the Hopeless Savages Greatest Hits reprint collection came out in 2010, there were plans for it to be the precursor to more stories of the punk rock family. Now, five years later, those plans are finally happening! Zero’s in college (and hating it), though a tour with the Dusted Bunnies promises to rejuvenate her spirits — at least, that’s what she’s telling her therapist. But a rival band threatens to end the tour early, and without her family, Zero’s in no position to fight back. Meanwhile, the rest of the Hopeless-Savages are dealing with their own problems, including babies, contracts, and drug addictions. But if there’s one family who can pull it all off, it’s this one. This is the most exciting comic news of the spring for me, since I adore these characters and their loving interactions in exciting stories. I’m really excited to get to read more about them. Hopeless Savages: Break can be ordered now from your local comic shop with Diamond code APR15 1630. 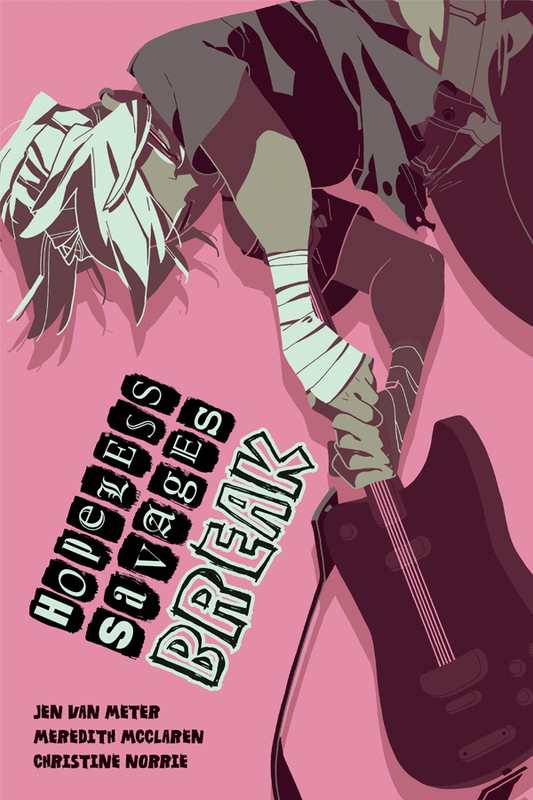 Update: (8/7/15) Due to “a production delay”, Hopeless Savages: Break is now expected in November, according to the publisher. This is terrific news, since I loved Ground Zero best of the three previous Hopeless Savages stories. Really looking forward to this! I just hope Ginger’s still part of the story.